As you know in our previous posts we discussed various topics i.e Finding & Removing Unwanted apps from Fb Profile,Locking Pc with a USB Device,Some Free tools for taking Screenshots,And we also discussed about the inclusion of the new features in iPhone 5s etc. 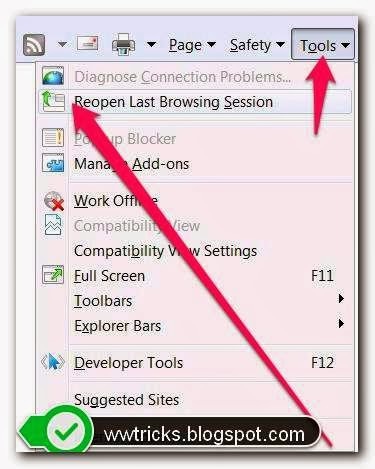 And now in this post we will be sharing some tips for browsers that How To Restore Last Browsing Session In Browser(Chrome,IE,Firefox etc). Do you know: How To Activate private browsing mode in your browser? Here we will be sharing how you can start your browser with the last browsing session where you left it in any browser i.e Chrome, Internet Explorer.Firefox,opera etc. In order if you just closed a tab and you want to get it back then just right click on any other Tab and then click on 'Reopen Closed Tab' So you will see the closed tab appear once again.You can also use the shortcut key Ctrl +Shift + T.
1)-> click on Chrome menu button and select settings. 2)-> On the settings page, under 'On Startup' select the 'continue where you left'. 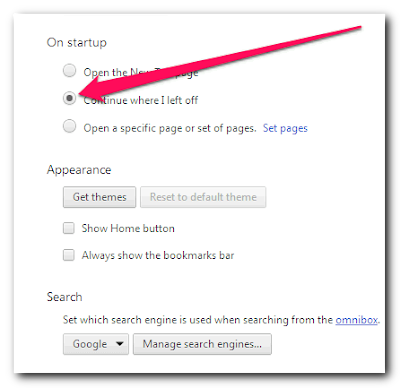 3)-> Now for the next time your chrome browser will start from where you left it. 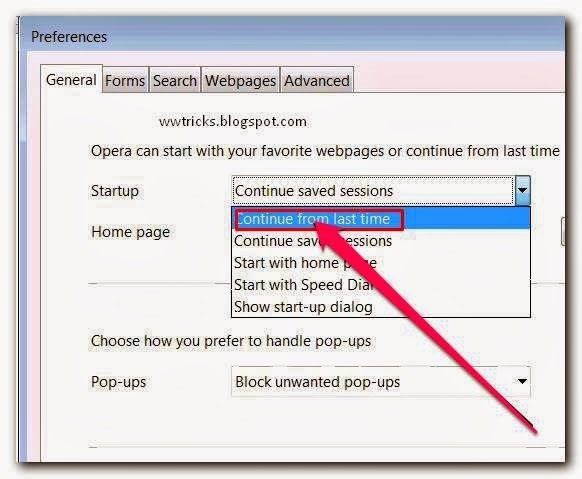 1: Click on opera menu button and then click on Settings. 2: Now on the settings page switch to General tab. 3: Select "Start From Last Time" from the Start Up drop-down list. As shown in below picture. 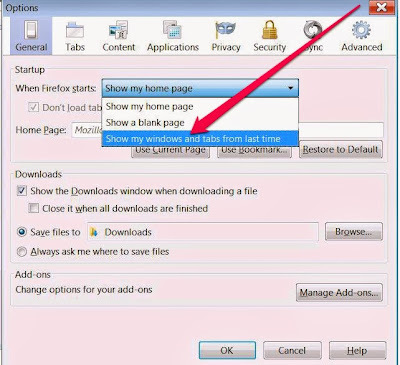 Now if you are using Mozilla firefox and want to start your browser every time from where you left it then it is very is to configure, what you have to do is, As given below. 1) Launch Firefox-> click on Firefox Menu Button. 2) Select the 'Options'from the list and switch to 'General' tab. 3) AT the top in General tab select 'Show my windows and tabs from last time' From 'when firefox starts:' Drop-down list. Now after that every time your firefox browser will starts with last browsing session automatically. Like the others browsers mentioned above IE not giving an option to make the browser to be automatically start with the last browsing session every-time but there is an option to restore last browsing session.To restore last browsing session in your internet explorer, click 'Tools' on the command bar and select "Reopen last browsing session". Now you will see all the active tabs of the last session will be start again. Did you like this post? : If you like this post and you think that it will be helpful for your friends then don't be selfish, share this link with your friends (Share on facebook). it may help them in the time if they lost their last browsing session.